Switzerland, jointly with Indonesia, South Africa, Mexico and the Ukraine, has the pleasure of hosting and organizing a country-led initiative (CLI) in support of UNFF11 (see UNFF website) on the topic of forest governance in changing landscapes. In 2004, a first globally oriented CLI focusing on decentralisation, federal systems in forestry and national forest programmes was conducted in the small alpine town of Interlaken. Since then, four regionally oriented workshops have been conducted: 2006 in Yogyakarta, Indonesia on governance and sustainable forest management (SFM); in Durban, South Africa in 2008 on governance and protected areas; in 2010 in Oaxaca, Mexico on governance and REDD+; and in the Ukraine in 2012 on governance and green economy. The UNFF Secretariat, several CPF members, including CIFOR, FAO, World Bank/PROFOR, IUCN and ITTO, and major groups have contributed to the successful implementation of these events. The series of workshops has clearly demonstrated that governance issues are of fundamental importance to achieving SFM and to the contribution of forestry to sustainable development1. The global CLI ‘Interlaken+10’ in February 2015 will tap on the experience gained and lessons learnt across the globe in the light of recent developments and trends to identify recommendations for the way forward to include meaningfully governance issues in a post-2015 international arrangement on forests. 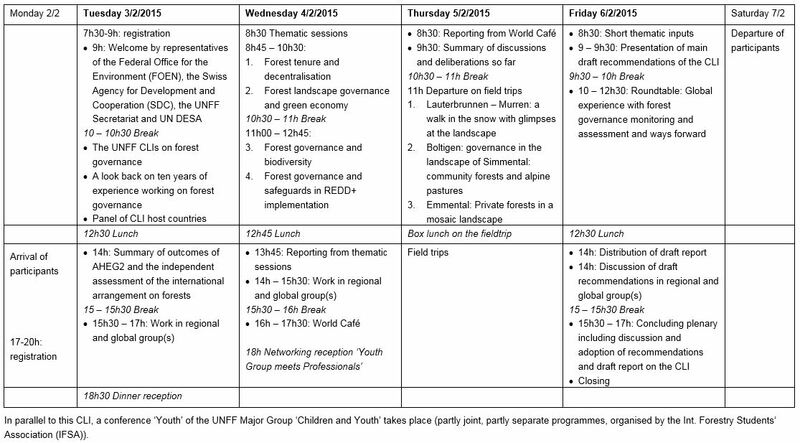 develop proposals and recommendations on how to foster good governance of forest landscapes to the UNFF and as part of the post-2015 agenda. Issues relating to governance are becoming an important element of the emerging post-2015 frameworks such as the SDGs and the deliberation of a new global climate agreement under the UNFCCC. The planned CLI provides an opportunity to analyse and anchor key aspects of forest governance in such wider post-2015 development frameworks. ‘Interlaken+10 will be an exchange between policy makers working at national, state and local government level, representatives of international organisations, local communities, civil society and the private sector. A special side event will be organised by the major group youth to prepare an input to UNFF11. The programme of the CLI will include three days of deliberations and exchange on guiding themes and a one-day field trip (workshop language: English).